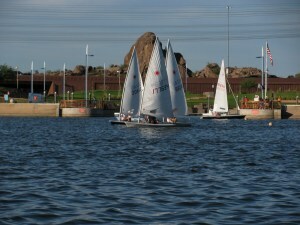 Arizona Yacht Club stages races and race committee training sessions at Tempe Town Lake almost 20 Sunday afternoons every year. The start times vary from 2pm to 3pm in order to capture the best wind and most favorable temperatures. Most Sundays we’re able to get in three to four races in the space of about two hours. See the Notice of Race (NOR) documents posted on the racing page for series information. Here’s a map and directions to get to the lake. The City of Tempe has extensive rules about lake use and it’s assumed you’ve read them and that you’ll follow them. Sign up to compete using the entry blank or online sign-up you’ll find on the racing page. TTL race series begin in September and January, so to catch the series at the start you should sign up about a month in advance. When our C14 fleet flag goes up (or your fleet flag) you’ll have exactly three minutes to the start. When the blue flag with the white square in the middle goes up it’s 2:00. When that flag comes down it’s 1:00. When the fleet flag comes down, the race is underway. A horn should accompany each flag change. Here’s a chart showing those times. The course will be described by black letters on a white board. We now use just two or three marks: orange (“O”) and yellow (“Y”) inflated buoys. The course will be designated as “YO” or “OY,” designating the order in which you’ll round the marks. If they put a “2” at the end of the letters, you’ll go around the course twice. Here’s the map of the course. We may use gates on the yellow end, two marks instead of one. If so, you sail between the marks and round either of them. At the start you’ll sail through the start/finish line adjacent to the committee, heading in the direction of the first race mark. Do not sail back through this line until it’s time to finish the race. Leave all the race marks on your port side (except if you take the right side gate, you’re round keeping it to starboard).